Photo by Jenny Neyman, Redoubt Reporter. Heidi Hanson walks in the rain along Kalifornsky Beach Road last month. Rain, snow, sleet, dark or any other conditions don’t stop her from biking or walking daily. 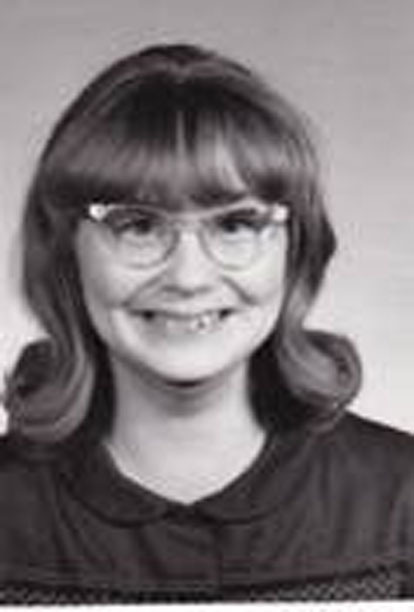 You might not think you know Heidi Hanson but you probably do, if not by name then by sight, or reputation, or as a source of inspiration. If you somehow don’t, you should. 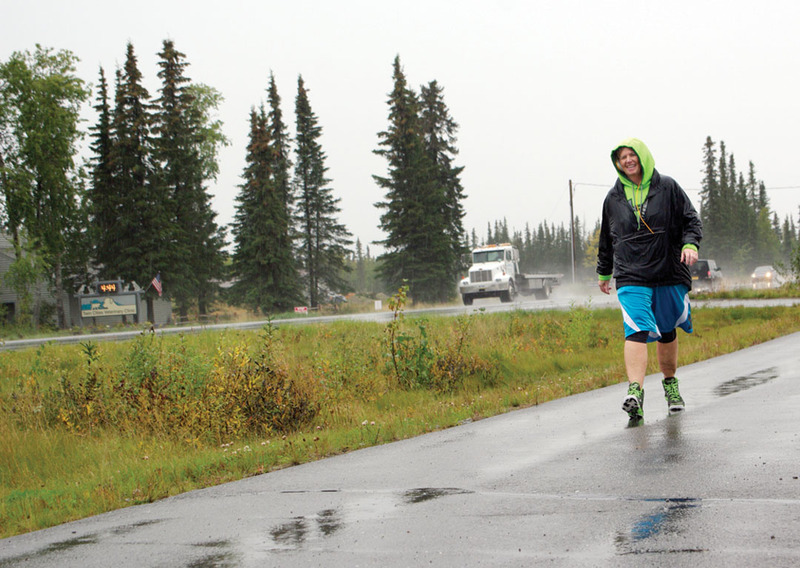 If you’ve been on the Kenai-Soldotna stretch of Kalifornsky Beach Road between about 4 and 5 p.m. — any day, any season, any weather — you’ve likely seen the Soldotna resident trucking along the Unity Trail. She’s the neon-accessorized streak on bike or foot, bulky Beats headphones clamped around her head, knee-length basketball shorts flapping in her pace-created breeze, only slowing down if she’s got a garbage bag in hand and is picking up trash strewn alongside of the road. If you’ve watched women’s hockey at the Soldotna Regional Sports Complex, you couldn’t help but notice Hanson, her 5-foot-9 frame in signature neon-orange gloves screaming around the ice with tanklike invulnerability, but with speed and agility armored vehicles could never hope to attain. Photo courtesy of Heidi Hanson. 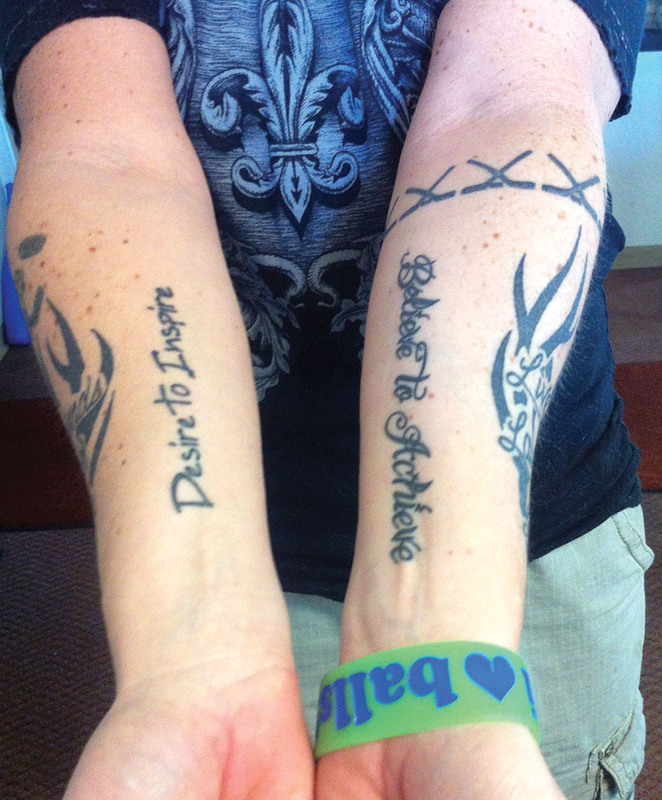 Hanson has her two mottos tattooed on her arms —”Believe to Achieve” and “Desire to Aspire.” Both have motivated her weight loss journey, and her efforts to help inspire others along a similar path. If you’ve played bingo or pull tabs in the area in the last 20 years, Hanson probably sold you your card. You’d remember it. Her exuberant laugh and unabashed, dimple-framed grin are contagious, all the more striking coming from a tattooed weightlifter who, at first glance, you might not expect to be so genuinely, gregariously friendly. 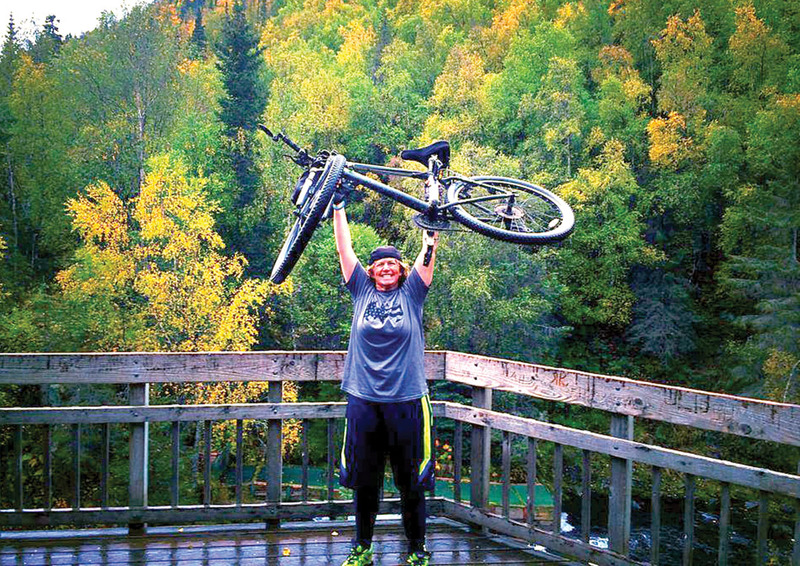 If you’re a central Kenai Peninsula resident with a Facebook account, Hanson’s photos from her frequent bear-viewing drives to the Cooper Landing area — a hobby she pursues with as much determination as her healthy lifestyle — have likely flickered through your feed. Perhaps you’re one of the 1,346-and-counting followers of her Believe to Achieve page, where she chronicles her path to lose weight, gain health and find continued motivation to keep on keeping on. Or maybe you’re someone needing inspiration along a similar path. If so, you just might meet Hanson face to face, as 15 peninsula residents since May already have, when she shows up to give you a brand-new bike and a firsthand example of how believing in yourself can lead to achieving dreams. And what is Hanson’s dream? Merely the simplest, yet hardest benchmark of all — living life on her terms, which means being healthy, happy and true to herself. Nowadays, at 45, she makes that look easy, like she does a slapshot, or keeping a blistering pace while biking into a wall of wind and rain, or being in the right place at the right time to see a sow and cubs meander out of the woods. She’s all grins and shrinking pants sizes, striking celebratory poses in her collection of superhero T-shirts. But it’s been a long road to get there, laden with steeper trials, both emotional and physical, than any of the mountain trails she hikes all summer long. And all overcome without the benefit of what she now provides to others — an outside source of encouragement, motivation and demonstration that things can change. Hanson is no stranger to struggle, answering it with a stubborn, self-reliant perseverance. As a teenager in Oregon, her love of basketball was benched after being hit by a car while riding a snowmachine. The accident snapped her lower leg in half, bending it backward with two ragged bones jutting from the skin. The hospital reconnected the bones with a plate and screws and secured it all with a cast. “But the circulation and everything was already gone. They put a solid cast on it and a week later when they took the cast off my leg had rotted away,” she said. Her mom got her into a Shriners hospital in Portland, Oregon, where doctors debrided the wound and performed skin grafts and muscle transfers. “It was nasty. I was lucky they were able to save it. It would have been gone if it wasn’t for the Shriners,” she said. Seven surgeries, six weeks in the hospital, a year on crutches and she still insisted on playing basketball her senior year of high school, even with the screws coming out of the bone. 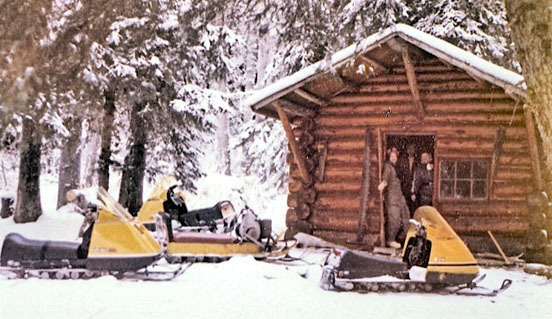 A year after her high school graduation Hanson followed her mom and brothers up to Soldotna, where they moved in 1989. Jobs came and went — managing Baskin Robbins in the Peninsula Center Mall, working at a day care, UPS, Soldotna Little League Bingo and for Peninsula Community Health Services as an individual service provider for school kids with disabilities. “There’s a couple more in between. We all have that experience, where you have to find your right thing before you connect with something,” she said. For the past 20 years she’s been selling pull tabs for various nonprofit organizations. “I like the customers. It’s just a fun job. 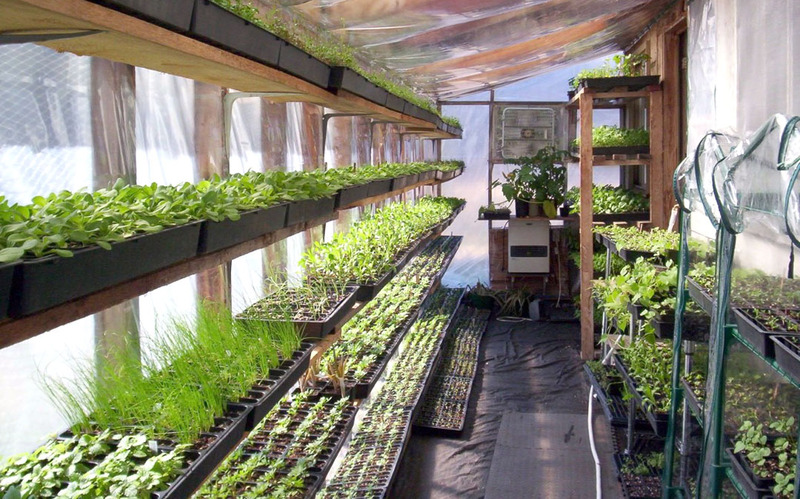 It doesn’t pay a ton of money but it pays the bills,” she said. Currently she sells pull tabs and team paraphernalia for the Kenai River Brown Bears hockey organization out of the Short Stop gas station on K-Beach Road. Not a bad gig, since she’s been skating for about 18 years and plays on the Alaska Avalanche women’s hockey team. Ultimately, she’d like to work in criminal justice, in which she got a degree from the University of Phoenix in 2008. She went to San Diego for a year in 2005 to pursue being a corrections officer. 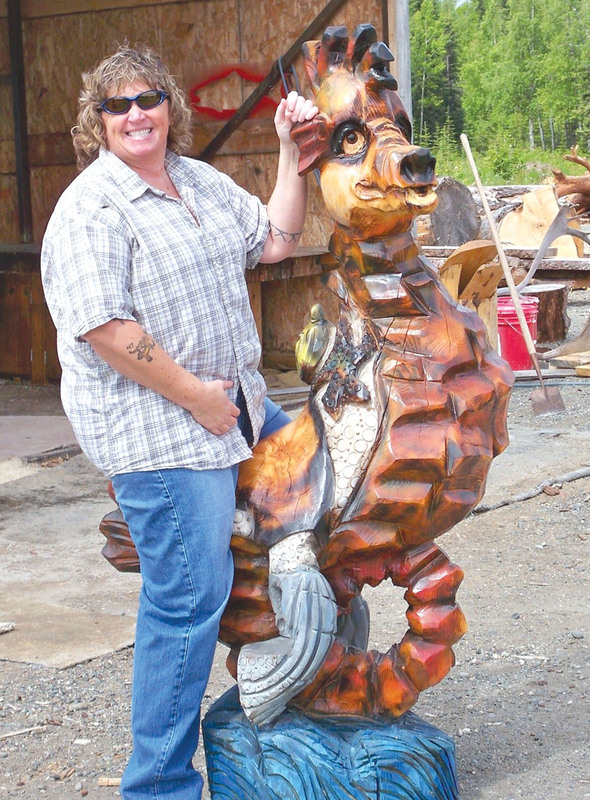 She’s hoping to someday get on at the Kenai Youth Facility, combining her interest in the corrections field with her enjoyment of working with youth. As much as she liked her ISP kids when working in schools, and as much as her nephews are a cornerstone of her world, Hanson has no kids of her own, for which she’s grateful. Her 15-year relationship, begun soon after moving to Soldotna when she was still basically still a kid herself, was with a volatile alcoholic. 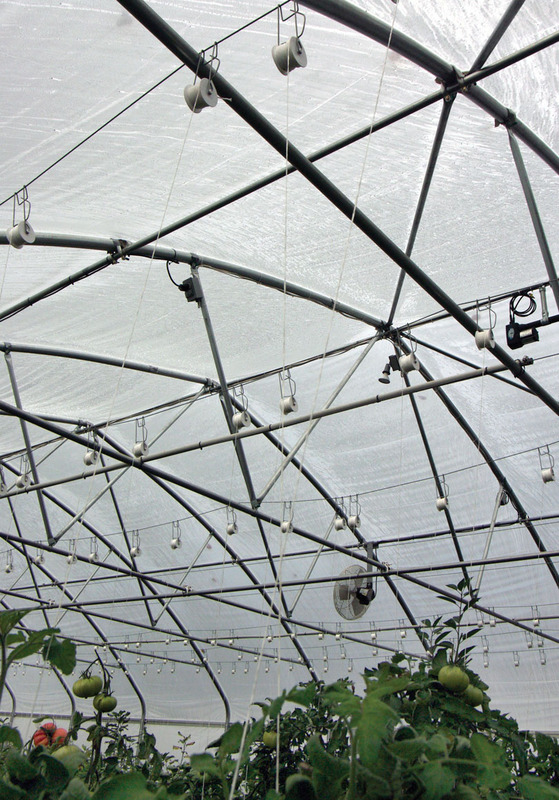 It had its highs, but increasing more — and more severe — lows. “I’d never had a boyfriend in high school. He gave me attention I had never had. It was just one of those youth things,” she said. Life was chaotic, draining and difficult when he was drinking. He’d go through cycles of treatment and sobriety, but inevitably returned to alcohol, dragging Hanson along for the ride. Finally, she kicked him out and instead of boomeranging back to her doorstep, he moved to the Lower 48. Not long after, on Dec. 17, 2004, he died in Las Vegas. “Suicide by cop,” Hanson calls it, shot by a police officer he was threatening with a knife. She now considers that date a birthday — her rebirthday, at least, where she could start fresh, focusing on living her life the way that makes her happy. Photos courtesy of Heidi Hanson. Heidi Hanson two years ago, at the start of her weightloss journey, at 245 pounds. Once free of her relationship and looking to turn her life around, Hanson found herself overweight and growing increasingly intolerant of the extra pounds. She has always been active, weightlifting and seasonally playing hockey, in particular, since her old leg injury prevents her from more jarring activities, like running and basketball. But diet and regular cardio exercise wasn’t a priority. “I let life set me back with my relationship. It’s not like I ever stopped working out and exercising, but I wasn’t doing it right. I wasn’t doing the right diet, mixing the whole scenario. I focused so much on weightlifting for a couple years, I didn’t have any cardio,” she said. She went to the gym five days a week and added walking on a treadmill — “Which is boring as hell, I’ll never do that again,” she said — but there was little result on the scale. Then her brother suggested she try HCG hormones. “He knew that I’d been in the gym, working out, and it wasn’t working. He called me one day — my brother who is totally antidiet — and said, ‘I want you to try this. I researched it, I’ve talked to people.’ I would never have done it otherwise, I’d never heard of it. I would have kept on taking my steps to try to change and not gotten anywhere. His encouragement made a huge difference,” she said. She took the hormone and followed the diet plan — healthy foods, only ingesting about 600 calories a day. Through it all Hanson kept exercising an hour or two a day, which is not advised but just try stopping her. “The doctor was like, ‘How are you doing that?’ I don’t know, I just did. It totally kicked my metabolism in place and it hasn’t changed since then. It just kicked me into drive and that’s it,” she said. She started her weight loss at 245 pounds. Modifying her diet was the first step. Finding cardio exercise she actually enjoyed sealed the deal. For that, all it took was getting outside. One day, on a whim — and in the winter, no less — she decided to go for a walk. “I just put on my shoes in the middle of winter and started walking, and the feeling of snow dropping down on me, I enjoyed it so I kept on doing it. I’ll be out there if it’s 20 below, it doesn’t matter,” she said. Now she exercises outside every day of the week, no matter the season, the amount of light or the weather, walking four to six miles or riding 15 to 30, sometimes doing both or adding a mountain hike in the evening. “When I get off work the girl who replaces me comes in and she’s like, ‘Are you biking, are you riding or are you hiking?’ She knows. It’s like my job. Seven days a week I’m doing something. I enjoy it. It’s good for me,” Hanson said. That combination is what it took for the pounds to start melting away. By February 2012, she reached her first huge — rather, getting-smaller — milestone. “When I got down to 199 pounds I lost it, I was so ecstatic, ‘I’m below 200 pounds!’” she said. She’s lost 70 pounds and had a tummy-tuck procedure in December 2013 to tighten up the now-superfluous skin around her abdomen. Her jeans have gone from a 42-inch waist to 34 inches. Her energy is through the roof. She did 19 hikes and bike rides in Cooper Landing with a friend this summer. She tried zip-lining in Seward. She went on her first halibut-fishing trip. She flew with her nephew across Cook Inlet to go bear viewing. Hanson on a recent bike ride in Cooper Landing, down about 70 pounds, and up a new lease on life. “This was probably the most adventurous, most active summer I’ve ever had since living here 25 years,” she said. But that’s not good enough. She still has moments of doubting that she’ll maintain her gains and continue to make progress. She still won’t wear a bathing suit without shorts over the top. She still hasn’t found a good guy — not that she needs a relationship, she said, but she wouldn’t mind the companionship. Most of all, she isn’t done challenging herself. The idea occurred to her last summer. “I don’t remember if I dreamt it or if I was just sitting around and my mind was thinking, ‘You know what, it would be nice to give bikes to underprivileged people who can’t afford them to get them active.’ I just thought about it last summer and this summer all of a sudden it popped in my head, ‘I’m going to do it,’” Hanson said. Her goal was to donate five bikes, even if she had to pay for all of them herself. She put the idea out through Facebook, asking for nominations of possible recipients, “If you know any children, teens or adults who are overweight and can’t afford but would use a bike, please send me nomination.” She got 20 or so nominations and gave away her first bike, to a young lady looking to get healthy, May 25. She posted the pictures and the effort took on a life of its own. “I gave away that first bike and all of a sudden people just started giving me donations for more bikes, and more nominations started coming in, and it’s just grown and grown and grown. It’s crazy how many people have wanted to help,” Hanson said. Friends and individuals, 11 so far, have sponsored bikes. Eleven local businesses so far have chipped in, and at this point Hanson is looking at switching to giving away ice skates or snowshoes to keep the program going through the winter. Bruce Gabriel, owner of Big G Electric, said he, like most people, knew of Hanson, seeing her on the bike path and around the ice rink, as he plays hockey, too. He was impressed with her then — “She’s a hockey player and very active in the community. You always see her out and about,” he said. But was even more impressed when he learned about the bike giveaways. Selfless is a good word for Hanson, said Marcy Brown, a hockey teammate and Hanson’s frequent hiking buddy. “She’s just one of the most giving people I’ve ever met, very generous and selfless,” Brown said. “I think she’s had some hard times in her life and she’s really dealt with that and come around and made some bad things turn into good and tried to make a good lifestyle. “She’s always looking for ways to help other people step up, and motivate other people to get healthy. She’s been down the road where she was heavier and she lost that weight. She knows how good it feels and she wants to help other people do that,” she said. There were evenings this summer when, even though Brown in the abstract wanted to go hiking, she wasn’t feeling incredibly motivated at that moment to do so. But wussing out is not an option when Hanson is in the mix. Even though they weren’t going to even make it to the trailhead until after 5 p.m., Hanson was still raring to go. “Sometimes, seriously, I don’t want to do anything after work, but if you’ve got a friend waiting for you, you go do it,” Brown said. And the bike program, Brown thinks, has been a motivator for Hanson. “Every time she gives one away it just inspires her to keep moving. She’s going to find something else to give away and it’s going to keep growing bigger and bigger,” Brown said. Hanson has given bikes to kids and adults, those wanting to improve their physical or emotional health. 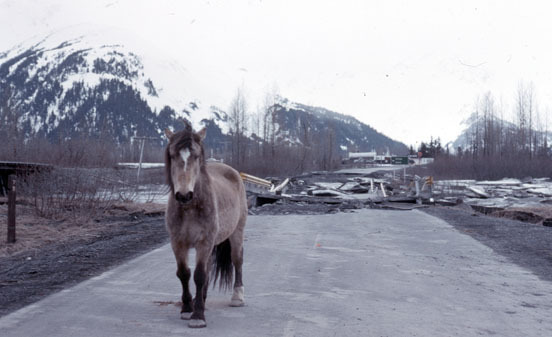 To people on the central Kenai Peninsula and in Homer, sometimes driving down herself to make a delivery. Photo courtesy of Heidi Hanson. 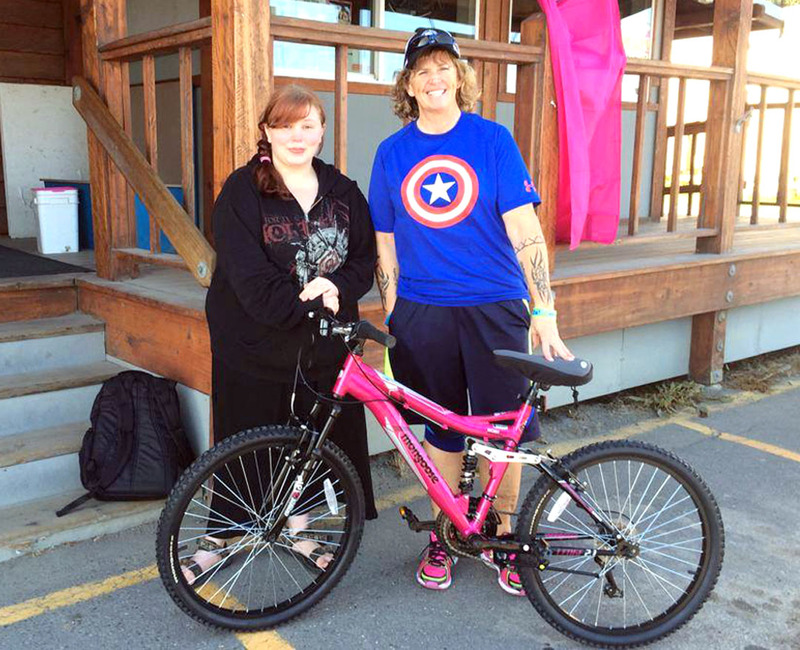 Heidi Hanson delivers a bike to Ashley Freeman in Homer in August. She surprised one of those recipients, Ashley Freeman, a college student in Homer, at work at Tech Connect in Homer. Freeman is 19 and loves to bike but hadn’t been able to lately, said her mom, Dianna Hahnlen. “She was walking to work because her current bicycle was kind of a disaster. She was riding it but the brakes are bad and when she would go to shift the chain would fall off,” Hahnlen said. Hahnlen’s friend Michelle Gaegal nominated Freeman after Gaegal’s husband received a bike from Hanson. Hanson brought a bike down to Homer and gave it to Freeman at work. “It was a surprise. Ashley was crying. I mean, she was just absolutely shocked,” Hahnlen said. “She’s been trying to lose weight and help her health and watch what she eats and everything, and this has really helped her a lot. It really helped her self-esteem because she has been losing weight since she started bicycling. Hanson vividly remembers Freeman’s bike, being touched that Freeman burst into tears. There have been lots of moments like that. The little boy who came back after getting a bike to give her flowers. Another shy little boy who gave her a hug, the many messages of support she’s gotten through Facebook. “One lady is going through cancer right now and said, ‘You are my inspiration. I go to the gym, I see you, I wish there were more people like you, more positive people.’ I said, ‘You know what, I appreciate that, but I’m just doing what’s making me happy and sharing it on.’ I get a lot of messages on there like that,” Hanson said. It’s gotten to the point where strangers are commenting on recognizing her. Truthfully, that part of it is a little uncomfortable, she said. “I’m not that kind of person that likes the spotlight, and I really didn’t create this to be in a spotlight. I just created it to help people out,” she said. Being recognized — for her generosity or just her tenacity out trucking along K-Beach — is the price Hanson will have to pay for being motivational. It’s a challenge. But that’s nothing she can’t handle. To donate to, suggest a recipient for and follow Hanson’s bike-giveaway project, visit her Believe to Achieve page on Facebook.